Design is tailor-made. We team with our clients to customize an approach for creating breakthrough ideas and distinctive solutions. We start with questions. Who do you serve? What are their needs and pain points? What designs will fuel delight and growth? Next, we craft the design journey ranging from a 2-day immersive, to a 5-day Sprint, or a large scale 6-month effort. All design journeys are grounded in IDEO’s design thinking methodology. Design is collaborative. All design efforts involve forming a design team of client leaders and Bridge experts to foster collective wisdom, bold creativity, and the fusion of knowledge and perspective. Design teams may be as small as 6 or as large as a full scale community engagement effort. Custom design journeys begin and end with the client. You are behind your success; we simply provide the path. Design is transformative. 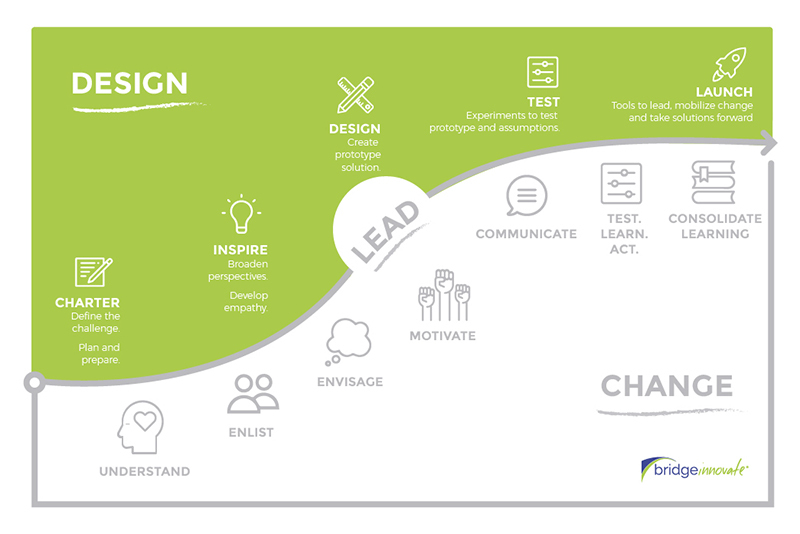 At Bridge, we blend a number of methodologies including human centered design, agile, strategy canvas, organizational change, visioning, appreciative inquiry, and scenario planning to help clients create transformational strategies, visions, organizational capability, and new market offers. The Bridge Innovate Field Guide provides everything you need to lead custom design journeys within your own organization. This step-by-step online guide is a one-stop-shop for business innovation tools, tips, and templates to help guide you through each design journey phase. When you book a custom design journey with Bridge, you will receive complimentary access to the Field Guide. Subscriptions options are also available. The future of an organization depends upon the people who lead it. Prepare your top talent to take your organization to new levels with Bridge’s customized leadership solutions of strategic challenge sessions, executive leadership retreats, and high potential development programs. Change is certain. Buy-in is not. Our agile approach to organizational change is an on-going capability complimenting iterative business cycles demanded by competitive markets.